21 Savage, whose legal name is She’yaa Bin Abraham-Joseph, was released on bond, Kuck said. He was arrested February 3 by ICE, which said he was born in the United Kingdom and was in the United States illegally. His birth certificate says he was born in East London to British parents. The Grammy-nominated rapper’s arrest shocked his legion of fans because he is closely associated with Atlanta and its music scene. He has said the “21” in his name is a reference to a street gang in Decatur near Atlanta, and his songs often refer to his past in East Atlanta’s Zone 6. But 21 Savage’s detention has also heightened awareness of the plight of undocumented immigrants, particularly in the Trump era. On Tuesday night, the website Mic released a video with a bevy of stars, including Kendrick Lamar, DJ Khaled, America Ferrera, Common and SZA, showing solidarity with 21 Savage and other undocumented immigrants facing deportation. 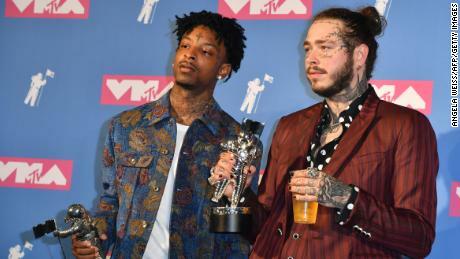 21 Savage was featured on Post Malone’s Grammy-nominated hit “Rockstar,” and he had been scheduled to perform at Sunday’s show before his arrest, publicist Tammy Brook said. Instead, he was mentioned just once during an award speech from “This Is America” songwriter Ludwig Göransson. “We want to thank all the rappers that are featured on the song. 21 Savage, who should be here tonight,” Göransson said, earning applause from Post Malone. 21 Savage was brought to the United States at age 7 and in 2005 left before returning a month later, according to Kuck. In 2006, 21 Savage’s parents failed to renew his visa. He’s been living in the United States illegally since then, according to immigration officials. His attorneys Kuck, Dina LaPolt and Alex Spiro issued a statement Tuesday on behalf of the performer that thanked his supporters. Kuck has said his client has a U-visa application pending with the US Citizenship and Immigration Services and “has relief from removal available to him.” The visa application was filed in 2017, four years after the rapper reportedly was shot six times during an incident in which a friend of his died. 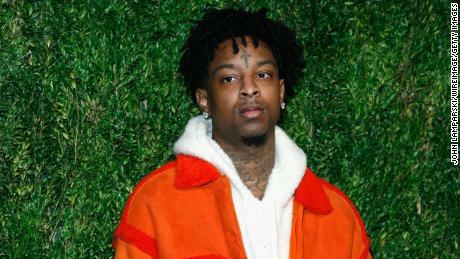 The rapper announced a “21 Savage Bank Account” campaign last year that gave 21 teens $1,000 to start their own bank accounts and learn about financial literacy. In October 2014, 21 Savage was convicted in Fulton County, Georgia, on counts of marijuana possession with intent to distribute, possession of a firearm or knife during the commission of certain felonies and manufacturing, delivery, distribution and/or possession of a controlled substance with intent to distribute. The rapper’s representatives said the conviction was expunged. He began rapping in 2013 and became part of Atlanta’s robust underground hip-hop scene. In 2017, his studio debut, “Issa,” hit No. 2 on the rap charts. His latest album, “I Am > I Was” was released last month and spent the first two weeks of 2019 atop the Billboard 200.